The General Election Commission announced today the official results of local elections. 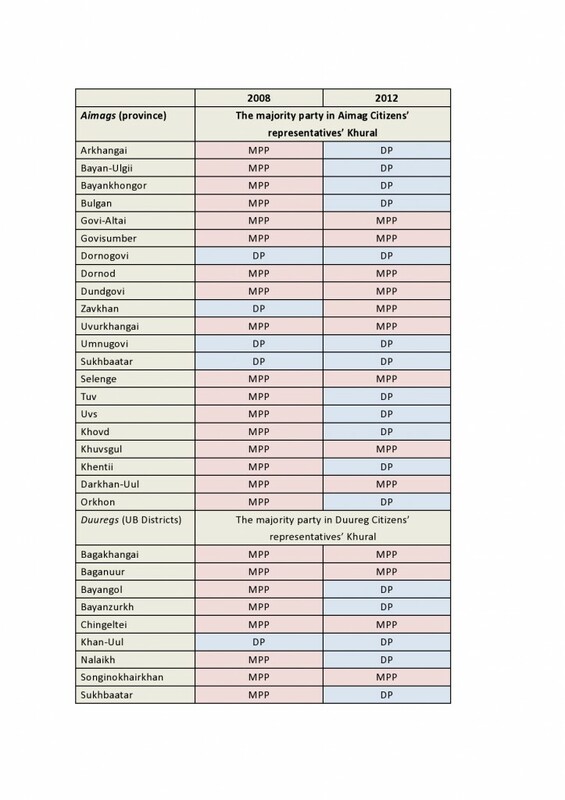 In the run-off elections in six capital city districts, the Democratic Party (DP) won in 4 districts and the Mongolian People’s Party (MPP) won in 2 districts. Overall, the DP won in 12 provinces and 5 districts and the MPP won in 9 provinces and 4 districts. Below, the 2012 election results are compared with the corresponding elections in 2008. This entry was posted in Elections, Politics and tagged BYAMBAJAV Dalaibuyan. Bookmark the permalink.